I love looking at images of cute parties on Pinterest just as much as anyone else, but what I really want to know is what are people doing at these parties? I always want a detailed breakdown of events because I like to know how people are keeping their guests entertained amidst all the cute decor and then copy the fun activities! For anyone else who likes the details, I have a breakdown of what went on at my 8 year old's Shopkins Party. We had her party at an incredibly cute party venue in our town called House of Hadley Kate. When we booked her party, they did not have a Shopkins option so we got to customize what we wanted to do. 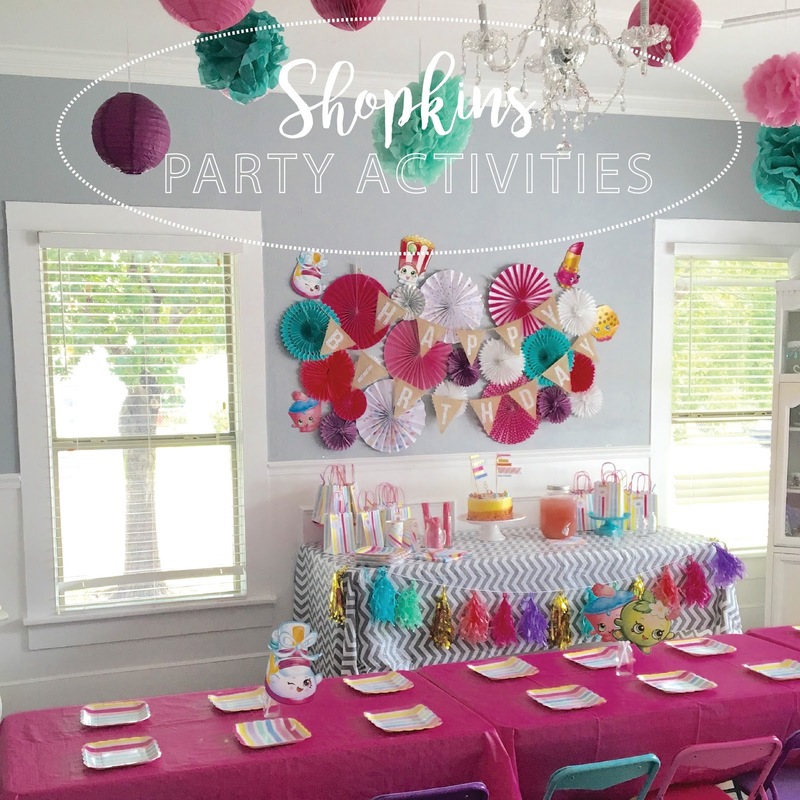 Luckily, they had some great ideas and my daughter had some clear ideas of what she was hoping for because I was initially at a loss as to what kind of activities we should have at a Shopkins party. For those of you who don't live nearby, or who are pros at doing parties at home, these activities would be relatively easy to implement. We had just over an hour for activities and the birthday girl picked what she wanted to do. She chose 2 crafts (Shopkins charm bracelets and Shopkins snow globes) bingo, and a Shopkins Swap. While they were making bracelets they also worked on their snow globes. They either got to select a Shopkin from a bin that was provided or one from their personal stash. We made sure to let the girls know that these Shopkins would not be coming out of the jars as they were super glued to the bottom of the jars. They alternated between bracelets and globes because the glue needed some time to dry before they jars were filled with water. I didn't ask where they found their mini "mason jars" but these from the Dollar Tree are almost identical. 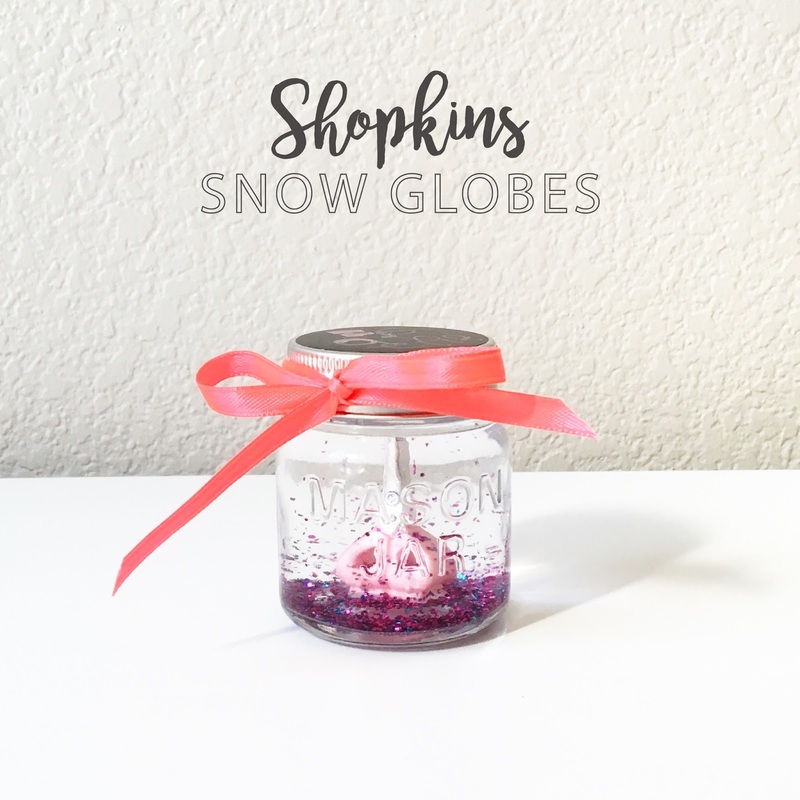 The guests were supplied with a slew of glitter options to fill their jars with, as well as glycerin drops, water and some ribbon and markers to decorate the lids with. I loved seeing what the girls picked out, and how they mixed glitter colors as well as shapes (they had some heart shaped glitter). How cute is this little snow globe? I am also a huge fan of projects that double as take homes. Laminated bingo cards, plus some bingo markers (they used sparkle stickers and Shopkins) and you've got a guaranteed 15 minutes of fun. For the last chunk of the activity time the girls did a Shopkins Swap. I made sure to print on the invitations that each girl should bring any Shopkins they were interested in trading and these girls came PREPARED. Some had organized bins, others pencil cases filled with Shopkins, some with gallon ziplock bags etc. The birthday girl got this cute Shopkins purse as a gift from a friend and filled it with the Shopkins she wanted to trade. There was some serious wheeling and dealing going on my friends. We finished off the party with pink lemonade and pizza, as well as cake and ice cream. Then handed out some cute favor bags with little tags that said, "Thanks for making my party Shoptastic!" Inside the favor bags were some of my daughter's favorite candies (the strawberry Pocky were from World Market, but if you have a 99 Ranch Market or Daiso nearby they have even more flavors and the Pop Rocks were from the Dollar Tree) plus a pencil (from the dollar spot at Target) and a krazy straw. The party was a hit and now I can hibernate until we do another friend party in a few years (we alternate years between friend and family parties which as worked really well for us so far).